Congratulations to Alice who has been having Driving Lessons in Paignton and has passed her Driving Test this morning first time with only 3 minors. Well done and stay safe on the road. 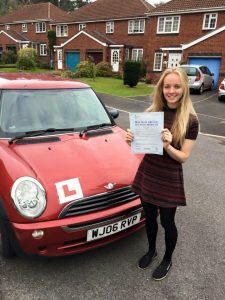 For Driving Lessons in Paignton, Torquay, Brixham, Newton Abbot and all surrounding areas visit www.thedrivingschoolsw.co.uk or call us on 01803 640607.